Good Reads & Favorite Places, Let's Do Coffee! What would you pay to have someone come and clean your house? What if they did more than just clean? What if they made your house everything you’ve always dreamed it would be so that when you invite friends over, there aren’t any distractions—no clutter, no dust–not a single thing to make you bite back an apology. Recently some one made me an offer I couldn’t refuse. I, too, wanted a place to make my friends feel right at home, so she set in motion the most splendid endeavor. She picked out a lovely color scheme and redid the whole interior, handling every aspect of the remodel down to the tiniest detail. Beautiful antiques now fill every room. A honey-colored hardwood floor greets everyone who steps through the door. It’s absolutely beautiful. 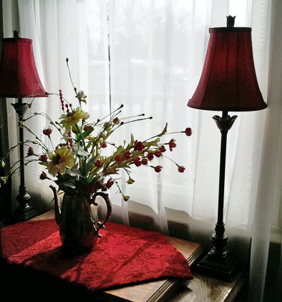 She placed an oak table over by the window where the morning sun shines in. I can’t tell you how wonderful it was to sit and sip coffee there with my sister the other day when the temperature dipped well below zero. Did I mention that this woman of impeccable taste also arranged to keep the place spotless? She maintains everything so I don’t have to lift a finger. Anytime, I can open the door and everything looks beautiful. Did I mention that she also hired a staff to cook for me? No more rushing around trying to get the muffins into the oven before company arrives. In fact, Karen makes sure that I don’t just have muffins—I also have homemade cinnamon rolls, brownies and even caramel apple bread-pudding. The only drawback is that it’s tough to make a decision when faced with so many choices. You must be thinking, Wow, Mari’s speaking venture has really started to pay well. How else can she afford to have someone redecorate, hire a cleaning crew and even pay a staff to cook for her? Can you imagine what that must cost? Well, if you really want to know—it could easily cost you less than ten dollars. Uh-huh, you read that right, worry-free hospitality for less than ten dollars. We all want to enjoy time with a friend, a sister or a special group in a place that’s warm and inviting. We want to share a memorable treat, something we don’t enjoy everyday. But face it, when do we have time to make that happen? Oftentimes practicing hospitality requires more time and energy than we can muster, so we avoid it. And we beat ourselves up over it. Fortunately there are people who devote countless hours to creating places where you can escape the busy-ness of life and invite your friends and family over to enjoy time that’s good for the soul. That’s what Karen Vondracek has created in her beautiful place–Káva House & Café–in Swisher, Iowa. At the end of my last speaking trip through northern Iowa, I stopped here with my sister and enjoyed a relaxing morning visiting over a hot mochas. We split a generous-sized serving of breakfast omelet casserole and each found something to take home, too. I walked out the Káva House & Café door with a container of raspberry-peach bread pudding—and the satisfaction of sharing the morning with my sister in a perfectly delightful place. Keep this in mind when you’re tempted to ask why would I want to pay extra for a cup of coffee, when I can swing through the drive-thru or brew a perfectly good one at home? In these tucked away coffee houses, you not only get a cup of coffee but someone has poured her heart into giving you a clean, beautiful place to gather with friends and to enjoy a delectable spread of treats together. She’s spent plenty of sleepless nights figuring out how to make this possible and has invested countless hours attending to every detail—so you don’t have to. All for under 10 dollars. That’s a real bargain if you ask me. Previous Post Signed up for LIVING FRAGRANCE? Hi Carol Ann, Great to see you here again! One thing I didn’t mention in the post is how I felt like I “belonged” at Kava House. The people working there acted like I was one of the regulars and had a genuine smile as they conversed with all the customers. So nice to not feel like just another “grande-mocha-2%-no whip’!” yelled out over the noise of the expresso machine already steaming milk for the next order. I am so impressed with how you captured the Kava House! It is one of my favorite places, and Karen is the driving personality that makes that happen. She does have delightful taste, and the fresh baked goods that Jessie makes are amazing! It is such a cozy place to spend time. My neighbor introduced me to this enchanting spot and I have encouraged others to join me for times of good conversation and to keep our friendships thriving. Thank you for reminding me of how special time spent in a charming place with dear friends can be. I need to make that more of a priority! Kathryn, My pleasure to capture a little bit of the Kava House. You’ll think I’m funny but I started my count-down to the Kava House a couple of weeks before the trip. I’d been working hard and I knew that was where I wanted to relax at the end of a busy stretch of life! I look forward to going back so I can get to know Karen and her crew better. I want to thank this Jessie for creating all those wonderful variations on bread-pudding. Plus, I need to get to those cinnamon rolls! Kava House is a very hospitable place! Enjoyed this article and the photos, but enjoy going to Kava House even more. I know what you mean…It would have been fun to write this piece while sipping coffee at a table in the sun at KH&C! 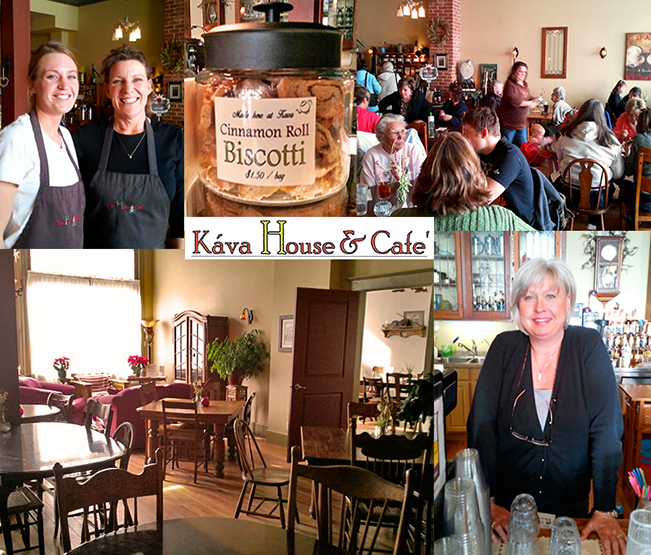 Hey all–Find the address and business hours of this Iowa gem on the Káva House & Café home page. Hey Rikki–Tried to click through your link to your new blog but didn’t find it. Are you still getting it ready? Would love to visit when you’re up and running. As for advice–I’m barely seasoned–but will say: Comparison…just don’t even go there, sweetheart. There are so many blogs out there and it’s easy to cruise around and think what am I doing here? But I was listening to Beth Moore yesterday and she was talking about how we’re all planted in a field and it’s one that God’s designed specifically for us to go in and give ourselves to and harvest to the edge. We’re not in it alone. There are others we’ll share the walk with, but he’s given us all a place to use our gifts, flourish, try, fall down and rise up again–always depending on Him. So here we are, walking together. You’re planting, sowing, tending and harvesting exactly in the field–the life you’ve been given and the lives you are involved with–and each person blogging is in their field. We all get to meet and share with many different people. (And to work/play/share with each other, too.) It’s a very cool thing! Okay, Rikki, you go, girl! Also, ‘look forward to seeing your eye for design expressed in your blog. OOoooo … this looks like a place I would LOVE to visit! 🙂 This post is a perfect example of how hospitality doesn’t only have to take place “in” our homes. Indeed. I appreciate women like Karen who give us a special place to reconnect with friends and family (or God’s word) and forget about everything that’s not checked off on our to do list at home for just a little while. How refreshing. My, my, you had me going at first. A few lines in I decided there’s some twist. And then, you made me appreciate locally run cafes! Glad to get a “my, my” out of you. I consider that a real compliment! Hope you stumble upon a cafe that’s just as nice as the Kava House soon. Enjoy the coffee…and a whole lot more. Aw, thought sounds great. This is me going to Starbucks every morning of my life.